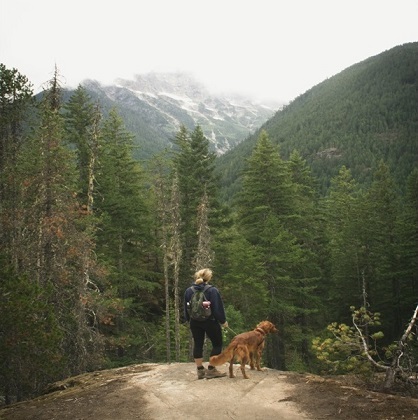 Do you want to go hike with your four-legged friend? Are you wondering about the essentials that you need to bring when hiking with dogs? If so, then you have come to the right place. We have compiled a list of important hiking gear for your convenience. With the aid of an essential collapsible bowl, you will be able to offer your dog water and food with ease. Often, these lightweight bowls come with a loop that allows you to fasten a bowl to your dog's leash or your pack, making it easier to utilize without the need to dig through your other gear. Pack at least eight ounces of water per hour of your hiking trip. On the other hand, when you are hiking in hot weather, make sure to fill a plastic water bottle three-quarters full and then put it in the refrigerator-freezer the night before you go hiking. As you hike, the ice will melt giving your dog a cool and refreshing source of water. Be sure your dog doesn't drink water from ponds and puddles as parasites and bacteria often found in standing water can cause your dog to become sick. If you are hungry on hikes, your furry friend likely is as well. With that said, don't forget to carry nutritious food and treats for your pet. Come ready with delicious and nutritious options to retain your pet's high energy level. It is best to feed your pet a small amount on a regular basis to avoid the uneasiness of walking on a jam-packed stomach. On the other hand, make sure to bring more foods than your pet eats typically because he/she will be burning more calories than usual. In addition, dog treats can also give your dog quick energy during an energetic day of hiking. You can also use treats to modify your dog's behavior while on the trails if necessary. Before going on a hike, make sure that your dog is trained enough and can be trusted to behave when encountering other dogs, people and wildlife. If this is not possible, it's best not to take him or her hiking. A dog backpack is an essential for longer hikes. Even on short hikes, let your dog carry his own gear. You can train your adult dog to carry gear in a backpack. But remember, to avoid any developmental issues, do not place packs on dogs younger than one-year-old. When going outdoors, always make sure your dog has an ID tag and carry a picture of your pet in your backpack. This is vitally important if your dog gets lost. You can use the picture to create flyers to post in the nearby communities. Plastic bags always come in handy on a hiking trip, most especially when you are dealing with the waste of your dog. This essential can be utilized to pack your dog's waste with you and then fasten them outside of your pack using a carabiner so that you don't need to put them inside. As an alternative, you can use a small plastic spade to bury the waste. First aid kits are essential. Thus, bring along some basic supplies during your hiking which will help with injuries your dog may encounter on trails. *Tweezers to remove a foreign object in wounds. Clothing like insulating jackets, dog flotation devices, bandanas, and booties should be kept on hand so that you and your dog are ready for special activities and hostile weather conditions. Before heading out, make sure to check the weather conditions where you're headed as well as identify what type of clothing your pet may need. For instance, a pair of booties can protect the paws of your dog on a rough trail and in icy conditions. A neck gaiter or bandana well identify your pup as a pet and can be used as a bandage when needed. A dog floatation device always comes in handy for trips that involve boat rides and the insulating jackets can help a short-haired dog stay warm on a winter hike. A harness or collar is usually made of colorful materials which can be noticed from a distance. Either way, make sure that the harness or the collar of your dog is loose enough that you can slip your fingers underneath with ease. As a reminder, don't ever make use of choke collars, since it may strangle your dog or get trapped on low branches. Leashes, on the other hand, are necessary by decree or just by common politeness. Thus, you must have one handy for your dog at all times. Some people, as well as animals, have a strong and negative reaction to particular insect repellents. With that said, before leaving your home, make sure to drop a bit of repellent on the covering of your pet's fur to determine your dog's reaction to it. Look for symptoms like nausea, drowsiness, to lethargy. Remember to limit repellent applications to only areas your dog can't lick. More importantly don't forget to examine yourself and your dog's skin for foxtails, ticks, and other trail pests after your hike. After a couple of hours of hiking, nothing beats a comfortable area where you and your dog can rest. That said, you can bring a lightweight sleeping bag with you when you go hiking. You can also bring a camping pillow (learn more) if you want or if you have. There you have it, the essentials that you need to bring when hiking with dogs. Hopefully, this content will help you and your pet have a good hike. Tim Fox blogs at Outdoor With J .If he is not writing for his blog, he enjoys a day on the trails with his lovely dog.